Awarded two Gold Trophies and two Merit Certificates. Crusoe, an Indian premium innerwear brand from Jagannath Textiles Company Limited, has been awarded two Gold Trophies and two Merit Certificates at the Visual Merchandising and Retail Design (VMRD) Awards 2012.Crusoe’s flagship store located at Brookefields Mall won Gold Trophy for Best Store Design and Best Store Front. The Merit Certificates were awarded for Best Lighting Design and Best Fixture Design. Abhishek Tibrewal, Chief Marketing Officer, Crusoe, said, "We are extremely delighted to be recognised as one of the best stores for design and architecture. It is the ultimate acknowledgement of our mission to create Crusoe store in alignment with the brand DNA of being adventurous, a unique brand experience for our valued shoppers." 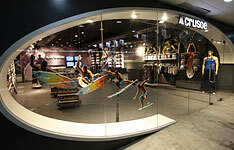 Crusoe’s unique store design showcases fixtures, furniture, ceiling, lighting, shelving and window display – all derived from elements of adventure sports. For example, skateboards form shelves for merchandise and kayaks form lighting in ceiling. The store concept derives its form from the “wave” and façade being the first start point of the store, the customer interface was given the form of a “surf wave”. All graphics and imagery project the brand attitude of being adventurous and reinforce the brand promise and communication.